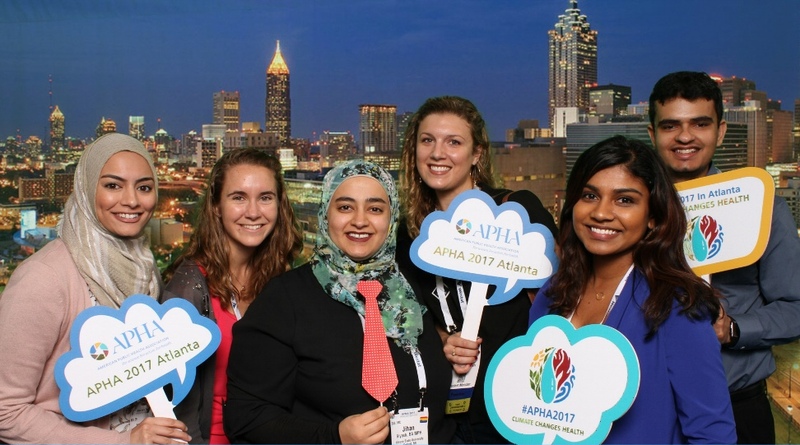 An annual gift from Wayne State University School of Medicine Class of 1959 alumna and legacy donor Ann Lewicki, M.D., M.P.H., made it possible for eight Master of Public Health students to attend the American Public Health Association's annual meeting last month in Atlanta. Students Maliha Ahmed, Micia Eddins, Stephanie Krajnik, Dixy Rajkumar, Elyse Schultz, Lea Selitsky, Bin Liu and Jihan Aiyash were selected as recipients of Dr. Lewicki's Master of Public Health Student Grant Award. Ahmed, Krajnik, Schultz, Selitsky and Liu presented posters at the meeting, and Aiyash was a student debater on the APHA Disability Section Student Forum's winning team. The WSU Master of Public Health program, administered by the Department of Family Medicine and Public Health Sciences, prepares graduates to apply evidence-based knowledge from behavioral and social sciences, biostatistics, epidemiology, environmental health and health care organization to understand and improve the health of the public, use appropriate research and analytical strategies to address public health issues, and communicate public health principles and findings to professional and community audiences. "While presenting my poster, I met with other like-minded individuals who care about the health care of incarcerated persons and improving health disparities more broadly," said Selitsky, who attended the 2016 meeting using the same award. "Moreover, I was able to connect with the HIV/AIDS section of APHA, of which I am now an executive board member. This experience broadened my exposure to the world of public health and enhanced my network in the field as well." "Attending APHA has been an important part of my growth as a future public health clinician. I remain grateful that Wayne State has a wonderful scholarship program that allowed me to pursue my studies in public health," she added.